The Finale – Day 3 | Finally, then . . .
Instantly I was in the Spirit and looking at a marvelous throne. But what really caught my attention was the One sitting on the throne! How can I describe the scene? He radiated beauty like that of pure gems: jasper and carnelian, with an emerald-like rainbow encircling Him. Surrounding His throne were twenty-four more thrones with twenty-four elders upon them. 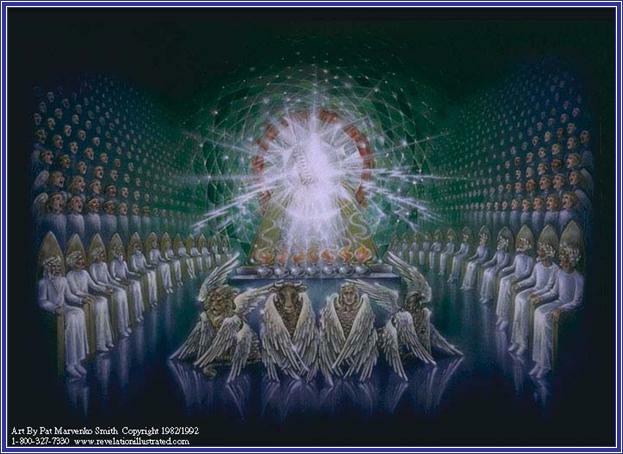 They wore white garments and had gold crowns on their heads. Flashes of lightning and loud peals of thunder came from His throne. There were seven lamps burning in front of the Throne, the seven Spirits of God. Stretching out in front of the Throne was a crystal lake, clear as glass. Then I noticed that the One seated on the throne held a scroll in His right hand. It had writing on both sides but was sealed up with seven seals. That’s when I saw Him approach the throne — a Lamb, One that had obviously been sacrificed. He had seven horns and seven eyes which are the seven Spirits of God sent out into the whole earth. He came and took the scroll from the right hand of the One who sat on the throne. The four living creatures kept saying, “Amen!” And the elders fell down and worshiped.